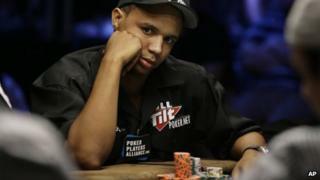 A New Jersey casino is suing a professional poker player it says won $9.6m (£5.7m) by cheating at baccarat. The Borgata Hotel Casino in Atlantic City says that in 2012 Phil Ivey relied on a tactic called edge sorting to help him guess the value of face-down cards. It says he studied the cards' back sides for imperfections "to gain an unfair advantage". The nine-time World Series of Poker winner is considered one of the best players in the world. No lawyer was listed for Mr Ivey in federal court records and the BBC was unable to reach him for comment. In the suit filed in federal court in New Jersey on Tuesday, the casino said Mr Ivey created "a situation in which he could surreptitiously manipulate what he knew to be a defect in the playing cards in order to gain an unfair advantage over Borgata". The Borgata alleges that Mr Ivey and an accomplice gave directions to the dealer to flip the cars in a specific manner, citing superstition. The casino accommodated Mr Ivey's request, it says. Mr Ivey's true intent was to gain advantage over the house by tracking the cards' edges as they were dealt through the pack, the casino says. The casino demands Mr Ivey and his co-defendant Chen Yin Sun return the winnings. The Borgata has also listed card manufacturer Gemaco in the suit, saying the company failed to guarantee its cards were free of defects or distinguishable marks. Mr Ivey had previously been accused of edge sorting by London casino Crockfords, which withheld more than $12m in winnings. He later filed a lawsuit against Crockfords to release the funds.